It should come as no surprise that most Scottish artists that express an opinion on Scottish independence are Yes supporters. Artists are so often at the forefront of political engagement and their job is to offer an interpretation of our everyday experience with their imagination and creativity. A new nation, uncharted, and ours to build, is something that is therefore immediately attractive to the artist, and the many possibilities it presents an obvious opportunity. For some artists it’s easy. For me it was music that helped shape my political view. Runrig’s agenda was defiantly political and after performing those songs I knew I had to get in there to help make the changes I felt were required for my nation. We also constantly toured Scandinavia pre- Scottish Parliament and it hit me how those nations were at one with themselves, cohesive and confident, only to then return home to Tory run Scotland. The fight for the Scottish Parliament summed it up. This was my generation of direct cultural engagement and all artists that had an opinion were on the side of ‘our’ Parliament. The soundtrack of the coming of the Scottish Parliament was a golden era of Scottish music including Deacon Blue, Simple Minds, Hue and Cry, The Shamen, Runrig, The Proclaimers and so many, many more, all emphatic in its support. I’ll never forget the ‘Day for Scotland’ concert at Stirling Castle when Michael Forsyth, still seething about this happening in his constituency, tried to get the whole thing stopped at the very last minute by demanding the power be cut. The No to a Scottish Parliament had difficulty in mobilising cultural support then, just as the No to Scottish independence struggles today. There will indeed be artists who believe in the UK but those that have emerged have struggled to present a viable cultural case for remaining shackled to the UK state. In one of its few cultural pronouncements ‘better together’ profoundly informed us that ‘British’ music wouldn’t be ‘our’ music after independence as if music observed the ‘borders and foreigners’ agenda that exists in their heads. And what does No offer artists? A ‘Vote No in the belief that this is as good as it gets’ . A vote No ‘ to tell the Scottish people why they can’t do this and we’ll stop them doing that?’ Artists on the left will also have to side with the Tories in telling cultural Scotland why it isn’t good enough to run its own affairs. It just isn’t the cool option to be siding with those dreary naysayers and it’s no wonder artists are running a mile from their cause. I suppose the closest thing that the No campaign has come to some sort of cultural get together was David Cameron’s St Andrew’s Day event at 10 Downing Street. 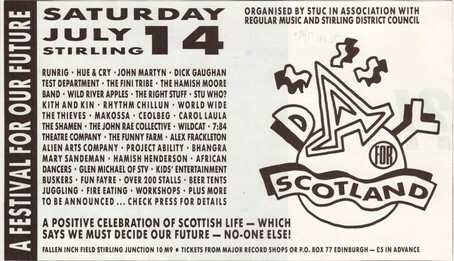 This shambolic event was boycotted by many of the invited artists (quite colourfully by Kevin Bridges) and they were left with Ronnie Corbett. I know bands agonise over political allegiance and my colleagues in Runrig had to put up with not one, but two, Parliamentary candidates, and for different parties. This time round, though, there is no ‘don’t know’ option. This time round artists will have to offer an opinion. It won’t be good enough to rely on a Parliamentary ‘none of the above’ and say they are not interested. Indeed they’ll just look daft if they try and duck the question. Artists should offer their opinion. We are interested in what they have to say because it is the artists that chronicle and creatively reflect our political reality. There has been no political change without a cultural gear shift and next year I think we’re going to be blown away by the beautiful noise of change and hope. This entry was posted in Uncategorized on December 16, 2013 by petewishart. I always supported a third question on the ballot paper. I thought it was just the right thing to do if a feasible option could be worked out. My view is that the Scottish people should always be given the constitutional future they want and whilst I would campaign for independence, I would respect that if this is what our fellow Scots want, then this is what they should have. The UK Government, though, insisted that no such option should be allowed anywhere near a ballot paper. They were happy to concede nearly everything else – the question, the process and the management of the referendum, but there was to be no talk whatsoever about a third question. This is because the UK Government sees itself as the gatekeeper of further devolution in the United Kingdom and it will never concede this to an exclusively Scottish process. This is what happens if we vote no. We leave any further constitutional progress up to Westminster. For all the talk of further ‘more powers’ following a no vote, the unpalatable truth is that it will be up to the majority of those who inhabit the green benches on the banks of the Thames. Decisions about whether Scotland secures further constitutional progress would be taken out the hands of the Scottish people and probably end up in the hands of the Westminster Tories. This is your real leap of faith, and it is almost endearing to believe that a future majority Westminster Government would give us more powers just because the Scottish Liberals want them. If we vote no, Westminster would rightly believe that Scotland has had its chance and it is now their turn. Their agenda will be about resolving issues such as the West Lothian Question (which they hate) and ensuring that the Barnett Formula is reviewed to Scotland’s detriment. What about Labour you might fairly ask? Well, the Scottish Labour MPs see themselves (probably rightly) as the success in the Labour party in Scotland. It is they who have the massive majorities and it is they who win elections. Yet, it is they who are asked to give up more responsibilities to the almost dysfunctional ‘losers’ in the Scottish Parliament. ‘No more’ will be their call following a no vote and it is likely they will want to see some powers returned to their House in London, just as they argued in the last Scotland Act. 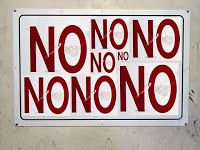 The simple fact is that no means no means no. Worse than that, it could possibly mean that some of our constitutional progress could be reversed. If Scotland votes no, it means we willingly submit ourselves to being ruled by Westminster and we allow our nation to be governed according to their priorities. A no vote means we accept it is they who are in charge and we will have to accept what they believe is in the best interests of our nation. 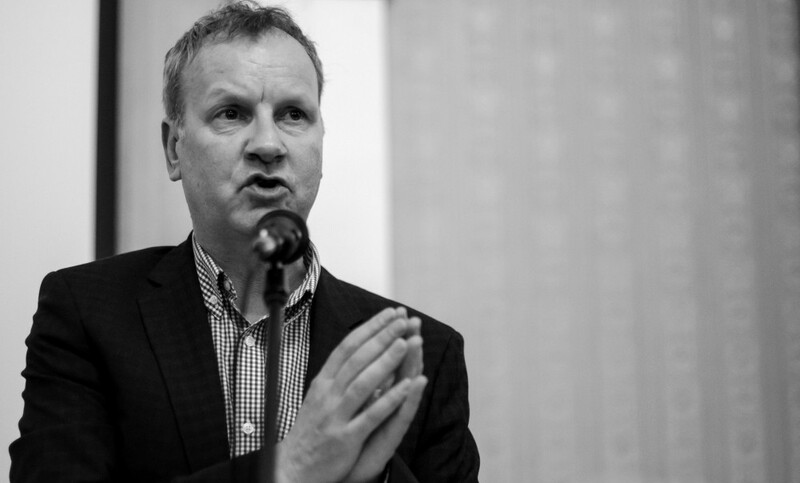 This entry was posted in Uncategorized on December 1, 2013 by petewishart.